A significant and highly relevant initiative for a province that distinguishes itself as a top tourist destination with its wide array of ecological wonders and richness of flora and fauna both in the terrestrial and underwater environments. Local landmark response to the National Eco-tourism Strategy (NES) and Program of the Philippine Government as expressed in Executive Order 111 that establishes the guidelines for eco-tourism development in the country. It rests upon the policy of the state to ensure the sustainable use, development, management, protection, and conservation of the country's environment and natural resources and cultural heritage for the enjoyment of the present and future generations. Bohol has been identified as one of the key sites that became the focus of concerted efforts to develop eco-tourism in the country, which were selected based on established criteria under the National Ecotourism Strategy. Non-government organizations (NGOs) have initiated the development of community-based eco-tourism destinations in the province that have now started to establish their market niches such as the dolphin and whale-watching tour in Pamilacan Island (Baclayon), the Cambuhat River and Village Tour in Buenavista, the Candijay Mangrove Adventure Tour or the variety of adventure tours in Rajah Sikatuna National Park. The economic and conservation-enabling benefits of eco-tourism enterprises have surfaced to the fore and each area teems with potential and prospects as an attraction. This is in addition to the Boholanos? inherent cultural trait and pride to welcome visitors with warmth and hospitality. Municipal local government units and the private sector, most importantly the investor have greatly benefit from this endeavor. We leave the hotel at 7:00 am for a 2 hour fast ferry ride to Tagbilaran City in the Province of Bohol. After 'lei' reception at the Tagbilaran Port, we proceed with the tour proper. The hills, which look like giant mole hill, are considered unusual geological formation that consists of at least 1,268 individual mounds that are scattered throughout the municipalities of Carmen, Batuan, and Sagbayan. The hills range from 30 to 50 meters high and are covered in green grass, which turns to brown during the dry season, making them look like chocolate mounds. A cuddly-looking creature with soft, grayish-fur; about 100 millimeters in height; with rat-like tail which is longer than the body and bat-like ears. The Tarsier (locally called the maomag)thrives mostly in secondary dense forests with a diet of insects as well as small animals. This nocturnal creature has the unique ability of being able to turn its head 180 degrees as well as to jump backward with precision. It is listed as one of the country�s threatened species. 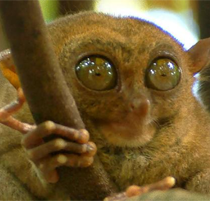 The Philippine Tarsier Foundation has acquired 7.4 hectares of land in Corella, Bohol for a Tarsier sanctuary. which serves as a visitor center and venue for research, as well as a habitat preserve. The Loboc River Cruise is one example of many successful community-driven ecotourism projects in the Philippines. Departing from a purpose built river pier, scores of "floating restaurants" provide lunch while leisurely cruising along the lush and beautiful Loboc River. Traditional Filipino buffet with a few western dishes is served while locals play the guitar to serenade you. There is an opportunity for you to watch or participate in a local community dance performance too. Not to be missed if you are love nature and appreciates local culture and communities. Loboc River Cruise - If you are a person who is a nature lover or who loves to experience serenity and a breath of fresh air and relaxing, This is a recommended activity for you. The cruise up the river though makes for an excellent after lunch siesta and the river in the area is quite pretty. Cebu City is an e.